I hope you each of you had a wonderful Christmas! We had a great time together and enjoyed being with family and friends. If you have read our blog for awhile you know I am HUGE into traditions. I think traditions are such an important part of family life. They give stability and comfort to children and are what create fun memories for our families. Do you have any favorite family traditions during the holidays? I would love to hear your tradition ideas and share with you some of our favorites. Most of our traditions revolve around food (shocker! ), but that’s part of the fun, right? Here are a few highlights from this season, and I can’t wait to hear your favorites as well. Every year after Halloween trick-or-treating is over I go through my children’s candy and pick out candies that would be fun to decorate a gingerbread house with. I keep these candies in my cabinet until the day after Thanksgiving and then we decorate gingerbread houses with their leftover Halloween candy. A great way to get rid of those extra treats you have laying around. The kids LOVE this tradition! If you want the perfect gingerbread icing recipe that will stick ANY thing to your house, here it is. Be careful…it dries out quickly and turns into cement if you don’t work with it quickly enough. With a hand mixer or in your Bosch, whip the egg whites until they become frothy. Add the powdered sugar and cream of tartar and mix on high speed until stiff peaks form. Mix for 5-7 minutes until frosting is thick and smooth and then it is ready to use. If you are not using right away, keep a damp towel on top of the frosting and keep in the fridge until ready to use. Works awesome! Another favorite tradition is our annual adult-only gift certificate exchange. With 15 grandkids under the age of 11 we are a crazy and noisy bunch, so this night without kids is a special treat. After dinner we go back to one of our homes to play this super-fun game. What you do is you have each adult bring a $15 gift card (it could really be whatever amount you can afford). You then are in charge of wrapping or bringing your card in a clever way. For example, if you get a Winger’s gift card you can put it inside a raw chicken, an IHOP gift card inside of a pancake, a Subway gift card inside of two slices of bread. The sky is the limit! The wrapping of these cards is what makes this game SO funny! We end up laughing hysterically all night and it makes the game more fun. You sit in a circle around the wrapped gifts and then you pass a set of dice around the circle. If you get 2’s, 11’s or doubles you get to open and choose a gift. Once all of the presents are opened we then set a timer for 5 minutes. The dice then continue to go around the circle and if you get those certain numbers you get to exchange a present with someone else, or keep the one you have. When the timer runs out you are stuck with the gift card in your lap. The game gets pretty intense when their are funny cards on the line. My brother in law brought a Boy Scout Store gift card wrapped inside a roll of toilet paper. We were all throwing that one around afraid we’d be stuck with it. The more crazy you make the cards, the more fun this game is. Either way…it is a really fun and inexpensive way to get everyone’s gifts done at one time and be together. This night is definitely a highlight of our Christmas! In a heavy bottomed saucepan over low heat, bring the cream just to a boil then add the brown sugar and stir just until it dissolves. Add small pieces of butter to the mix until completely melted, then stir in the chocolate chips. Wait 3-5 minutes so that the chocolate is soft before folding it in with a spatula. Stir in the salt and vanilla extract and blend until well incorporated. Let cool for 15 minutes–it will thicken as it cools. Serve over ice cream. This can be stored in the refrigerator for up to 1 week. Another favorite tradition is our Bethlehem Dinner. We got this idea from the Eyre’s and we love it! You have everyone (kids and adults..it was a stretch for most of the adults, throw on a bathrobe and call it good) dress up and come to dinner assigned as a certain person (shepherd, angel, inn keeper, Mary, Joseph, etc. You then eat dinner that would be similar to what they would have eaten back in Christ’s time. We serve Lemon Steak Pitas with grapes, grape juice, almonds, rice pilaf and Fig Newtons for dessert. After dinner we have the children (who are having a Bethlehem picnic on the floor) act out the Nativity story of Jesus’ birth. With 15 little kids it becomes quite hectic but is a fun memory for all of the kids. Chritmas Eve is my favorite tradition. The entire family gets together for a fancy Christmas dinner. We eat by candlelight and we try to get all dressed up and make it a special dinner. We always eat Chicken Cordon Blue, Rice, Blueberry Jello, Sarah’s Salad, Crescent Rolls, Green Bean Casserole and Chocolate Mousse for dessert. We have been eating this menu for as long as I can remember and it is something we eat only once a year (it takes us all day to make 35 Chicken Cordon Blues). After dinner we deliver our presents for a family in need and then come back to read Luke 2. Off to bed the kids go and the rest is history. Christmas morning we all get back together as an extended family and have a large breakfast. We serve Breakfast Pizza, Monkey Bread, Muffins and Breakfast Sausage Casserole. Delicious! After Christmas morning is over a nap sure sounds nice!! Spray heavily a 9×13 pan. Lay white bread on the bottom of the dish. Saute the sausage until golden brown. Spread the sausage on top of the bread. Cover with the shredded cheese. In a bowl, whisk together the eggs, milk, salt and dry mustard. Pour on top of the bread/sausage. Cover the dish with plastic wrap and let sit in the fridge up to 24 hours. 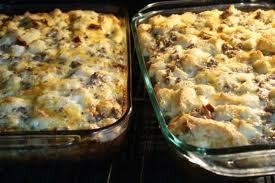 When ready to bake the casserole, pour the cream of mushroom and the 1/2 c. of milk on top of the casserole. Bake at 325 for 1-1 1/2 hours, or until the casserole is set up and the top is golden brown. Serve warm. Hope you enjoyed a few of our favorite traditions that make this time of year special. Stay tuned and I will be posting a few of my favorite appetizer recipes for your New Year celebrations. Thank you to each of you for your love and support throughout this past year. Our blog, website and business wouldn’t be what it is today without each of you! Merry Christmas and a Happy New Year!